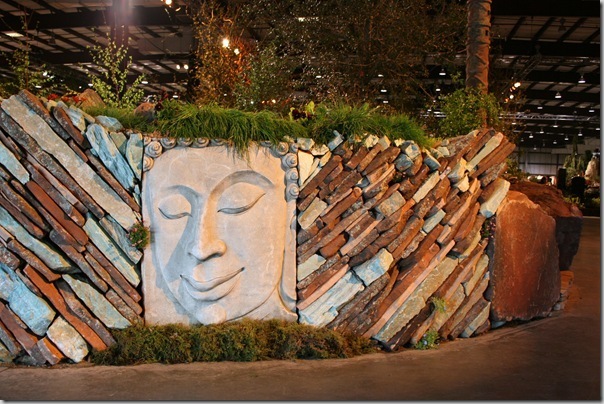 As I pointed out last year, garden shows are a place for designers to do all the crazy shiznit that’s over-the-top stunning, but also completely impractical, hard to maintain or otherwise unsuitable for life in the real world. 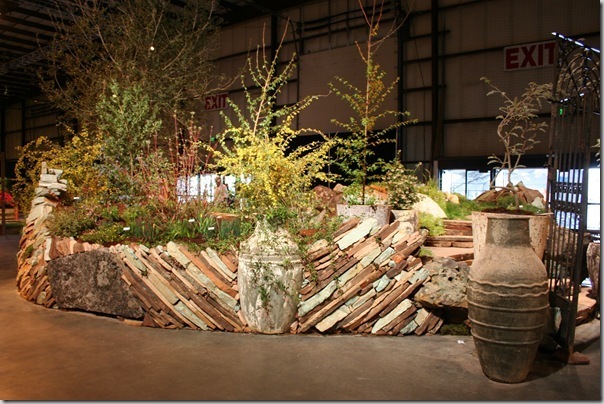 So without further ado, here are some of my favorite inspirations from the 2012 San Francisco Garden Show. 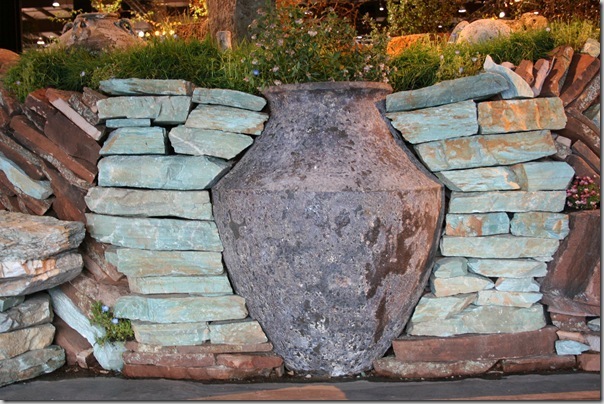 The way this vase or urn was incorporated into the wall is so beautiful to me. It creates a theme in the garden which they continue elsewhere, as you’ll see. This simple stacked stone bench is also a win. 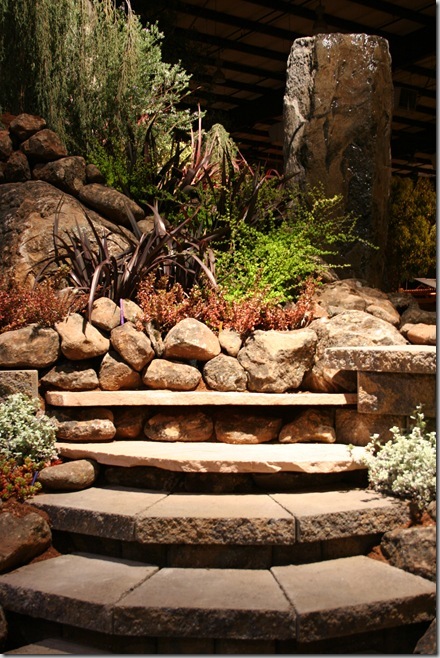 Easy to build, yet would fit well in a number of styles of garden. 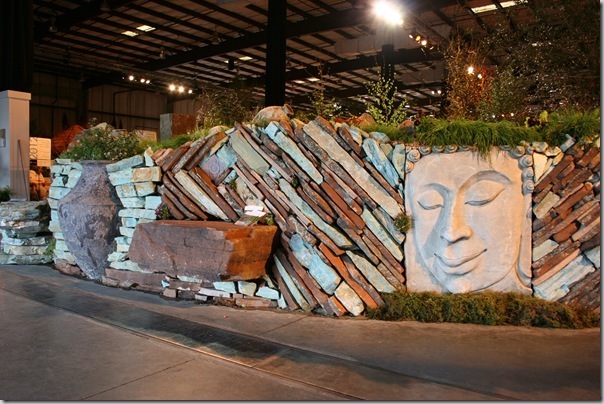 This style of stacked stone wall got rave reviews from everyone I spoke with at the show. 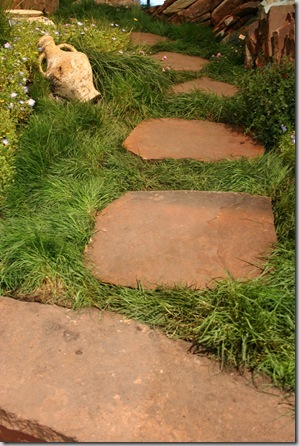 Landscape contractors, take note: This is an easy way of showing your creativity and artistry to clients. There is so much room to personalize this type of wall and make something that reflects your client’s tastes as well as reflecting something special about the site’s history or your region. No two walls need ever be the same. Another stone stairway below. I’m not sure the mixture of materials is 100% working for me, but there’s potential. I like the angular pieces at the bottom and think they might fit will with a Craftsman-style home or an Asian theme. They also remind me a bit of the angular lines on those old millstones. 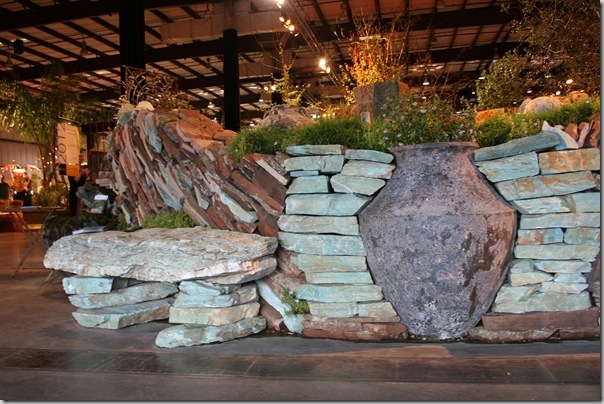 And below is a terrible photograph of a very cool idea from McKenna Landscape‘s display. 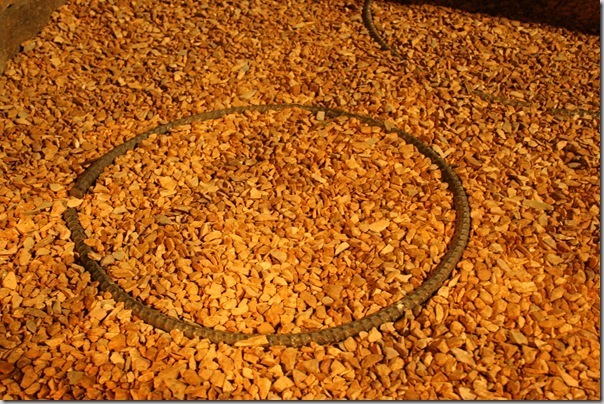 They had rebar bent into circles to provide the look of stepping stones in this crushed stone pathway without the shifting or messiness that can occur when you set stones into gravel. What an innovative use of an ordinary material! 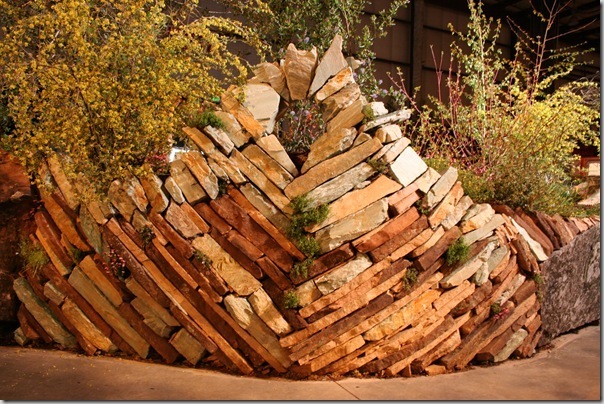 I love seeing rocks and stones artistically placed in the landscape. The Zen masters have it right. Me too, Mary! 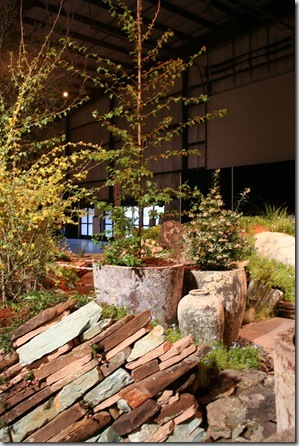 They make a landscape feel more mature and established if placed well. Wow, awesome rock work. 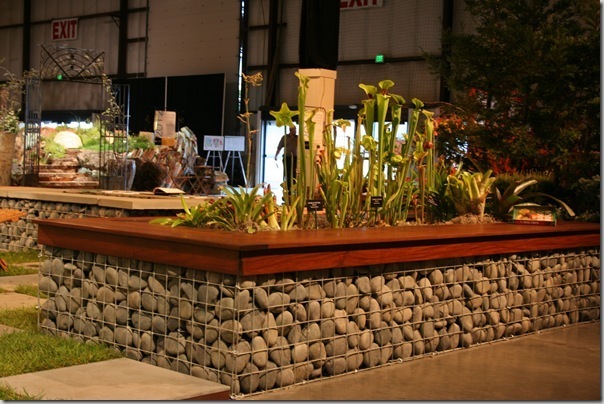 And that’s actually a pretty attractive gabion compared to any I’ve ever built. I know, I love the way they’ve put such a shiny, finished-looking top on it. Really takes the industrial edge off. I feel exactly the same about gabion walls. I love them but I’m not sure I’d want to live with them. Of course, I am such a casual gardener I am not sure I’d want to live with a lot of things that others love, so maybe it’s not just gabion walls! LOL. Those are innovative. So many great ideas you can take from the show. thanks for sharing. 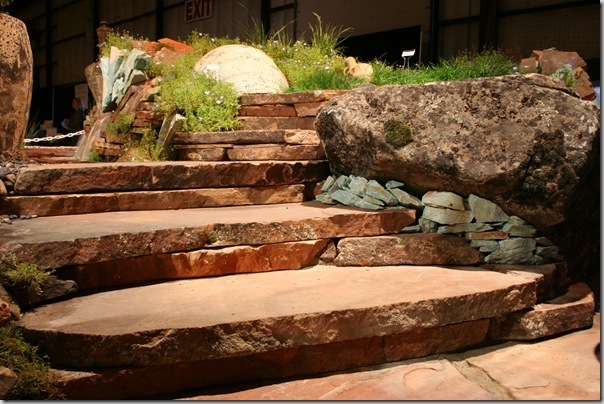 I love the natural uniformity that these big stone slabs give. I can think of a thousand steps, walls, points of interest that I’d like to use these for at my place. Sigh!! That stone walls look wonderful! We have a stone wall like that around our well garden that was here when we bought our place but sadly they’re not stacked properly and every Spring I have to walk around and rearrange stones because they’ve fallen or slid. 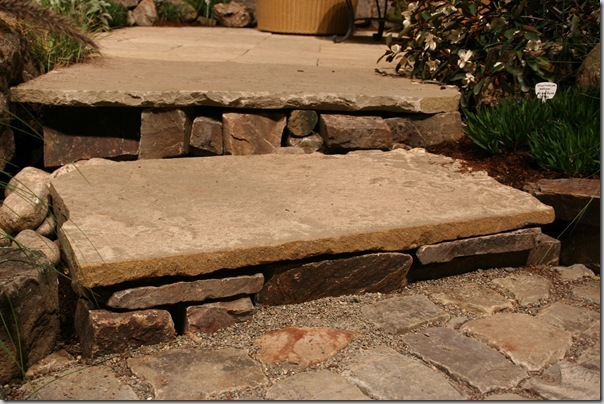 After seeing your wall I think I need more small flat stones to put in between the large stones for stability.